Casper is not just a store. It is a shop full of animal pleasure that you look up to every time. 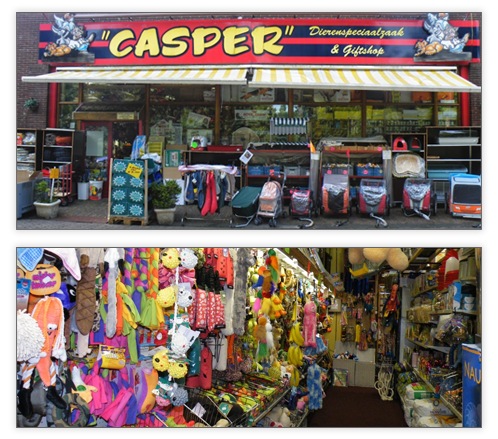 In our cozy, full store of 300m2 in Noord-Scharwoude you will find a large assortment in the field of nutrition and care for your pet. There is a lot of choice in the field of dog collars, lines, toys, snacks, dog coats, bird toys and so on. The lovers of cats, rodents, rats and ferrets also have plenty of choice. Correct fitting of harnesses and collars. 20 years of knowledge & experience. and only open on saturday & sunday from 10:00 tot 17:00. In this shop we are only selling a great collection of leather collars, harness and leashes for your dog. In this shop you wil not find items for ferrets, rats, chinchilla, rabbits or small rodents. You can find us in space 5.